China’s auto sales fell again in March, an industry group reported on April 12. Automakers and car dealers are also struggling with financial losses and huge debts. Sales of SUVs, sedans, and minivans in the industry’s biggest global market fell 6.9 percent from a year earlier to just over 2 million, according to the China Association of Auto Manufacturers (CAAM). It was the ninth straight month of decline but an improvement over the 17.5 percent contraction in January and February. For the first three months of the year, passenger vehicle sales were off 13.7 percent at 5.3 million. Sales of SUVs, usually a bright spot for the industry, fell 14.2 percent. Volkswagen’s March sales fell 5.9 percent year-on-year; first quarter production dropped 19.6 percent; and first quarter sales dropped 8.8 percent. GM’s March sales fell 10 percent, while first quarter production dropped 14.2 percent and first quarter sales dropped 13.1 percent. Sales by Chinese brands fell 16.4 percent from a year earlier to 833,000 vehicles. Their market share contracted by 4.7 percentage points to 41.3 percent. SAIC, headquartered in Shanghai, is one of the top four automakers in China. Its passenger car sales in March fell by 19.1 percent year-on-year; first quarter production dropped 16.5 percent; and first quarter sales dropped 17.5 percent. One of the worst performing companies is Shanghai Sunwin Bus Co., which makes commercial passenger vehicles. The company’s March sales dropped 100 percent from March 2018; first quarter production dropped 96.4 percent; and first quarter sales dropped 98.8 percent. Last year’s auto sales suffered their first decline in nearly three decades, falling 4.1 percent from 2017 to 23.7 million. As auto sales continue to drop, Chinese automakers’ debts and liabilities have increased significantly. As of April 7, total liabilities of the 13 listed auto manufacturers amounted to 865 billion yuan ($129 million), an increase of 11 percent year-on-year, and the average debt ratio is 66.1 percent, according to the performance reports released by the CAAM. Eight of these 13 companies have an asset-liability ratio exceeding 60 percent. Ranking on the top are three domestic brands: The Tianjin subsidiary of the state-owned FAW Group; Shenyang Jinbei; and King Long. Their asset-liability ratios are 97 percent, 85 percent, and 81 percent respectively. SAIC has the highest amount of liabilities, totaling 498 billion yuan ($74 million). Its asset-liability ratio is 64 percent. BYD Auto, China’s biggest electric vehicle maker based in Shenzhen, has the second highest amount of liabilities, totaling 134 billion yuan ($20 million). According to Chinese news portal Sohu, in the past five years, BYD received a total of 6.93 billion yuan ($1.03 billion) in electric vehicle subsidies from the Chinese regime. According to BYD’s 2018 annual report released on March 27, the company’s net profit attributable to shareholders was 2.78 billion yuan, down 31.6 percent from the previous year. Recurrent net profit dropped 80.4 percent to 586 million yuan ($87 million). BYD explained that the decline in net profit was mainly due the reduction in subsidies and an increase in research and development costs. Wang Xiaoqiu, Vice President of SAIC, said in an interview at the Shanghai Auto Show on March 29 that presently the company’s primary goal is to survive. Car dealers are also facing tough times as sales continue to decline. Last year, there were a number of news reports in the Chinese media about car dealers running into financial difficulties, price wars between dealers, or business owners disappearing without a trace, leaving behind debts and employees who had not received salaries for months. 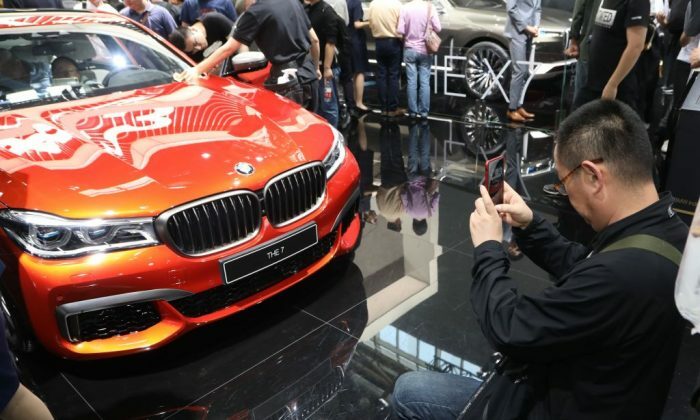 Overall, 39.3 percent of the car dealers suffered a loss in 2018, according to a survey by China Passenger Car Association. Even the biggest players in the market are facing severe difficulties. On April 4, Hong Kong-listed auto dealer Rundong Motor announced its plans to sell all shares in its four subsidiaries, with a total estimated value of 3.4 billion yuan ($506 million). Rundong ranked 20th nationwide in auto sales in 2017 and currently operates 85 car dealerships. This number will be reduced to 29 after the intended transaction is completed. According to Rundong’s performance report, its new car sales in 2018 decreased by 33.8 percent year-on-year, operating income decreased by 33.5 percent, and the company suffered a net loss of 1.52 billion yuan ($226 million). Apart from Rundong, Pang Da Automobile Trade Co, once ranked first in the country in auto sales, sold its dealerships last year due to financial losses. According to Pang Da’s 2018 annual report, the estimated loss reached 6 billion yuan ($893 million), Sohu reported. Chief editor of China Automotive Review, Zhong Shi, told the state-run China News in a recent interview that for China’s auto dealers, 2019 will be “very painful” and the challenges will linger and not disappear overnight. Chinese Premier Li Keqiang said at a Jan. 15 business and economics forum that China’s economy faces increasing downward pressure.